to interpret Modest Mussorgsky"s "Pictures at an Exhibition”. 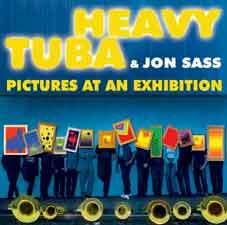 This latest interpretation comes from Austrias Jazzensemble "Heavy Tuba" on their new Cd. jazzy arrangement written by pianist helmar hill and all that comes along with irresisitible sound-engineering. After all, even if it"s pretty "heavy", there"s no need for Modest Mussorgsky to turn in his grave.